The Centre for Film and Media Studies is proud to announce that two of our alumni, Aliki Saragas (Strike a Rock) and Jessie Zinn (Can I Please Go to the Bathroom? ), have been selected for the Talents Durban. The Durban International Film Festival (DIFF) welcomes 19 filmmakers from 13 African countries to the 11th edition of Talents Durban, which takes place from 20 to 24 July during the festival. 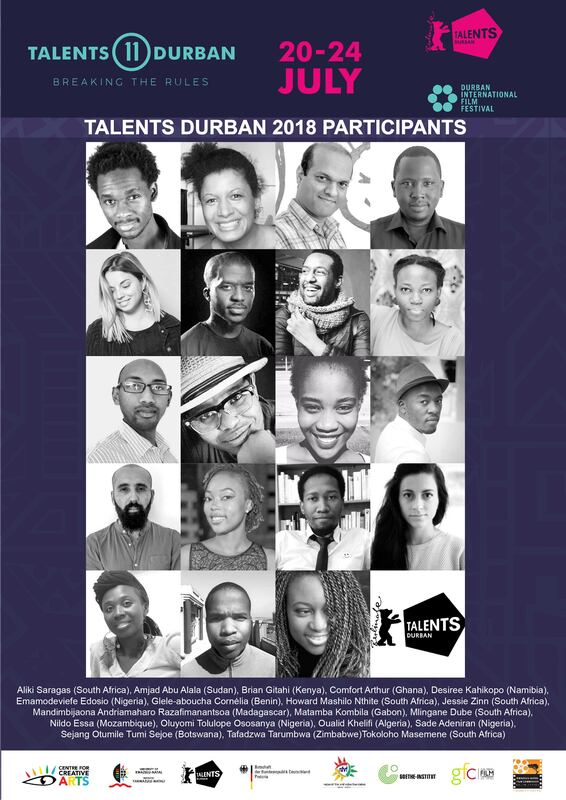 The filmmakers participating in this year’s Talents Durban are Aliki Saragas (South Africa), Amjad Abu Alala (Sudan), Brian Gitahi (Kenya), Comfort Arthur (Ghana), Desiree Kahikopo (Namibia), Emamodeviefe Edosio (Nigeria), Glele-aboucha Cornélia (Benin), Howard Mashilo Nthite (South Africa), Jessie Zinn (South Africa), Mandimbijaona Andriamaharo Razafimanantsoa (Madagascar), Matamba Kombila (Gabon), Mlingane Dube (South Africa), Nildo Essa (Mozambique), Oluyomi Tolulope Ososanya (Nigeria), Oualid Khelifi (Algeria), Sade Adeniran (Nigeria), Sejang Otumile Tumi Sejoe (Botswana), Tafadzwa Tarumbwa (Zimbabwe) and Tokoloho Masemene (South Africa). Participants will interact with over 600 delegates from the DIFF and Durban FilmMart, the co-production and finance forum that takes place from 20 to 23 July during the festival. The Talents will also participate in several project-oriented, hands-on skills development programmes. These practical development programmes within Talents Durban include Story Junction, masterclasses, and one-on-one mentorships. For more information read the Screen Africa announcement.